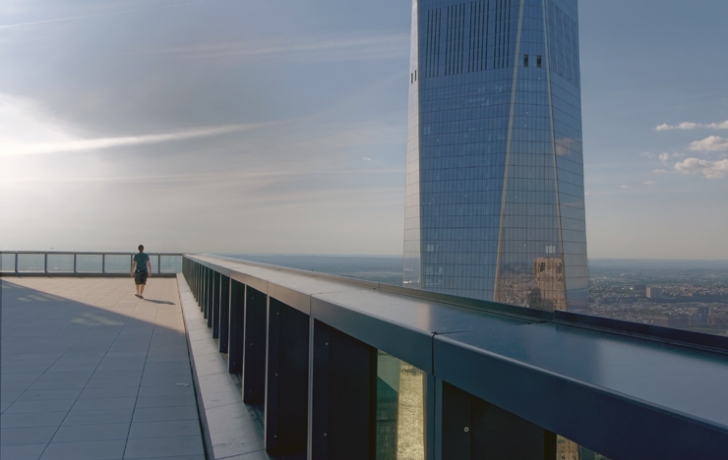 In a grand ceremony last month, Silverstein Properties cut the ribbon on its 80-story, $2.7 billion 3 World Trade Center. The skyscraper, however, is not expected to be move-in ready until later this month. Until then, attendants stand watch over a vast and empty 62-foot-high lobby while the 44 passenger elevators are grounded. Sweeping views, from floor-to-ceiling windows and three open-air terraces, for now go unseen. With the building currently 38 percent rented, many of the floors remain barren and silent. For my photo tour during this nascent stage in the skyscraper's life, Silverstein Properties assigned artist Conrad Stojak to accompany me. He is one of a number of artists who were given studio space in 4 World Trade Center. Now he works on the otherwise empty 48th floor of 3 WTC where he repurposes discarded parking meters into sculptural objects installed with miniature New York City-themed dioramas. "I come into the studio as often as I can," he says "It's a gift." Works by two street artists are on the vacant 68th floor. There is Grimace’s nearly life-size replica of a section of a graffitied subway car, and the figure of a leaping dancer in a mural by Zimer. While these and many other floors may remain empty for some time, soon enough this month employees from anchor tenant GroupM and other companies will start bringing the building to life, and 3 World Trade Center will never be quite the same again.